Shintia holds a doctorate in mathematics education from the University of Hong Kong, a master’s degree in mathematics education from Freudenthal Institute Utrecht University, and an undergraduate degree in mathematics education from State University of Jakarta (UNJ). Shintia is a qualitative researcher for the RISE Programme in Indonesia, specializing in teacher education and curriculum and instruction. She is currently working on the impact of pre-service teacher training programme on the quality of teacher candidates and how the programme contributes to student learning improvement. She is also involved in the study that explains the supporting or inhibiting factors of district education policy innovations. 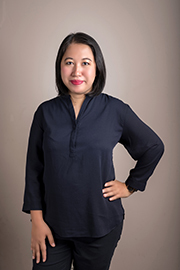 Prior to joining SMERU, she was a lecturer at Pre-service teacher education and PPG (Teacher Professional Education) program in Atma Jaya Catholic University of Indonesia and a research assistant at Faculty of Education, University of Hong Kong.